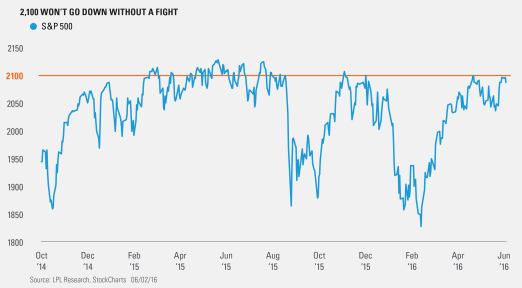 The S&P 500 Index is back up against the 2,100 level, and once again, it is acting as firm resistance. During each of the past two days, the S&P 500 was above this level at the highs, but eventually closed beneath this important psychological level. Think about this, going back to August 2015, the S&P 500 was above this level on an intraday basis 20 times, but only 8 times did it close above 2,100. Not to be outdone, the S&P 500 has closed at 2,099 on 9 occasions in the past 18 months. No other close has occurred more often at the single point level. So, 2,100 is a big level—what could it take to finally break above that area? Momentum could be the answer. The S&P 500 gained +2.3% last week, for the best weekly gain since early March. Going back eight months, the returns after a weekly gain of more than +2% have been very strong. As you can see here, five of the last six times the S&P 500 gained more than 2% during a week it was higher the following week and two weeks out. The returns two weeks out are very strong, with a median return of +1.8%. Now, it is worth noting the one loser was a huge 6.7% drop at the start of the year. Let’s take another look at the chart above. The returns when the S&P 500 was between 2050 and 2100 were rather weak. 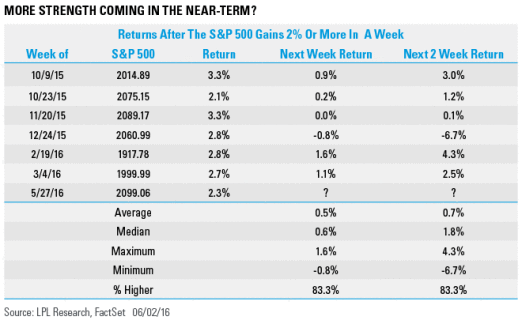 On the flip side, when the S&P 500 was beneath 2050, the near-term returns were strong. With the S&P back up near the top of this range, it could suggest a breakout will be tough. For other potential market drivers in June, see this week’s Weekly Market Commentary.